This post is the first in a three-part series on reading scientific papers in astronomy. When you are new to reading scientific literature, it is helpful to know all of the resources that are available to you. This series of three posts will go over a bunch of different resources you can use to help you read papers like the ones we cover on Astrobites. Undergraduate researchers (and researchers-to-be) have plenty of exciting reasons to read research papers! These may include (1) keeping up-to-date on the latest scientific advances, (2) trying to decide what sub-field of astronomy you want to work on, (3) learning background material for your new research project, (4) complementing what are you are learning in your astronomy class, (5) looking for relevant papers to cite when writing your own paper, or (6) just reading papers for fun to learn more about astronomy. Here on Astrobites, we have previously discussed some resources for reading papers and useful software for conducting research in general. We have also offered related advice on how to approach a paper (on which Science also provides a bunch of perspectives here) and for getting started with research in general. The first post in this series will focus on three websites you can use to help you find the research papers you are looking for. The next post will go through various places you can discuss papers or sit in on discussions. The final post will cover anything else related to this topic. 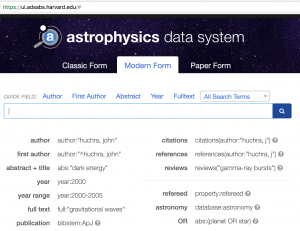 Without a doubt, all astronomers frequently use the SAO/NASA Astrophysics Data System (or “ADS” for short) – a search engine for finding papers. ADS searches for papers by storing their titles and abstracts. It covers the four main journals in astronomy (ApJ, AJ, MNRAS, and A&A) among many others, including general science journals such as Nature. Figure 1. Left: ADS home page. Right: ADS advanced search page. On the home page, click the search button on the right to use the basic search. Click the word “Search” below the search bar (and then “Astronomy and Astrophysics Search” on the next page) to get to the advanced search page shown in the right panel. If you conduct one of those searches (see Figure 2), you should be able to find the paper here, where you can read the abstract in plain text. On that page (the “abstract page”), there are also links to the published version (options E and F), as well as the arXiv version (option X) – which you can always access even when you are off campus (and too lazy to log onto a VPN). If you are interested in what the methods and results of the paper have been used for, click “Citations to the Article” (option C). You can also take a look at the “References in the article” (option R) to explore the paper’s background. Figure 2. Search results for “^birkby” sorted by date, where #2 is the example paper. Each of the different “letter options” on the right are explained in the text above. You can click either link circled in red to get to the abstract page, which also provides all of the letter options. Sorting options for the search results are on the top-right. For this particular paper, clicking “Sort by citations” for the references will lead you to the original paper by Michel Mayor and Didier Queloz on the exoplanet’s discovery at #2, and the original theoretical paper by Doug Lin et al. on how this exoplanet may have ended up so close to its star at #6. You can then click on the references on those abstract pages to get an idea of what type of work was being done leading up to the discovery of the first exoplanet. ADS also offers an advanced search page that you can get to if you click “Search” below the search bar (not the button to the right! ; see Figure 1a), and then “Astronomy and Astrophysics Search” on the next page. The advanced search page (see Figure 1b) will give you the option to search a range of dates, and also make it easier to search for topics by keyword in either the title, the abstract, or both instead of just looking for papers by specific authors. Another cool feature of ADS is that it can be used to keep track of papers for future reference. If you create an ADS account, you can store papers in libraries. On each paper’s abstract page, there is a button to “Add this article to private library.” Once you click on that, you can add it to an existing library or create a new one. For example, you can have a library to compile a list of papers related to your current research project, and another on recent papers that you have read. You can also create a library for all of your own research papers, and put a link to on it on your website (which can be useful if your last name is common and too difficult to search). Not too long ago, ADS released a new version of their interface called ADS Bumblebee, which is still in beta (see Figure 3). Unlike the original version, Bumblebee lets you search the full text of a paper instead of just the title and abstract. This makes it much easier to conduct broader searches on topics in astronomy rather than just papers. There are also more options to help narrow these searches down. Here is a tutorial video showing how to use some of the new features with the Bumblebee interface. Figure 3. Bumblebee: the new ADS interface. 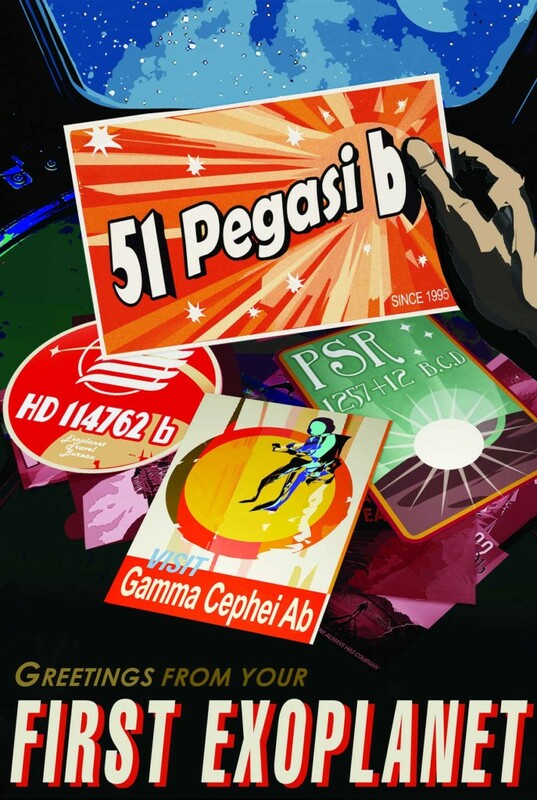 Astrobites’ slogan “the astro-ph reader’s digest” comes from the abbreviation for the astrophysics category on arXiv: astro-ph. arXiv (pronounced “archive” as if that ‘X’ was a Greek ‘Chi’) is an online repository for preprints – “final drafts” of papers that are about to be published. Most preprints are posted to arXiv when a paper is either submitted or accepted. If a paper has been posted before it is accepted, the authors will likely upload a new version to arXiv once it is approved by a journal. In astronomy, virtually all papers submitted to peer-reviewed journals are also posted to astro-ph on arXiv at some point. These arXiv preprints are nearly identical to the published versions, making the website an excellent open-access resource for finding papers. As mentioned above, ADS makes use of arXiv and includes these preprints in their search results. Figure 4. 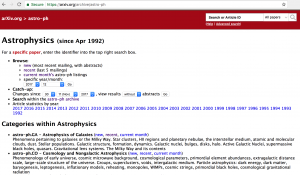 The astro-ph home page, featuring various ways to search recent papers and papers in general. Aside from storing open-access papers, arXiv is most commonly used to look through recent papers. Every weekday, you can check the “new” tab to view submissions from the previous day (see Figure 4). There is also a “recent” tab to see submissions from the previous week and a “current month” tab to see all submissions from this month. If you know which sub-field of astronomy you want to browse through, there are six sub-categories on astro-ph: Galaxies (GA), Cosmology (CO), Planetary Systems (EP), High-Energy (HE), Instrumentation (IM), and Stars (SR) – each of which has the same three browsing tabs. If you have written a paper that you want to submit to arXiv, check out this astrobite (and also discuss with your advisor about when to do so). Do you like arXiv, but wish it had pictures? Fortunately, someone else already thought of that. 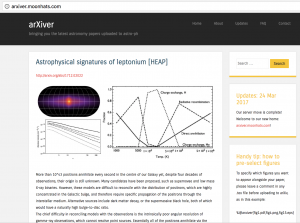 The website arXiver takes and presents all of the papers submitted to arXiv, but with a more modern design that also includes three distinct figures from each paper either chosen by the authors or at random. To me, having figures as part of the display format makes it much easier to recognize and identify individual papers that are worth reading or taking a look at, even if these plots are often difficult to interpret when shown out of context. Figure 5. The arXiver home page, showing not just the abstract of a paper, but three figures too. For those of you writing papers, the box on the bottom-right explains how to select which figures to display (or else, they are chosen at random). arXiver has also has a few other advantages over arXiv. Whereas arXiv only lets you look through the current month’s papers for a particular sub-category, arXiver gives you the option to scroll as far back as you want. This makes it easier to browse through older papers in a sub-category even when you do not quite know what you are looking for. Addtionally, arXiver randomizes the order of the papers submitted each day. (On the contrary, arXiv simply lists them in order of submission starting from 16:00:00 ET / 21:00:00 GMT.) Lastly, clicking on a specific paper will also lead you to three related papers (just like we have here on Astrobites). With these websites, looking for specific papers, conducting searches on papers in a given research topic, or just browsing through the most recent submitted papers should be a cinch. Stay tuned for the next post in the series on forums for discussing papers! Also, if you are interested in putting the process of navigating through papers into context, check out Emily’s Astrobite on visualizing all of the papers in astronomy.